THE TEERITZ AGENDA: Sunday March 4th, 2018 - Red Knitted Beanies, Vintage Laminate Tables, Cat-tags & This Week's Wristwatches. Sunday March 4th, 2018 - Red Knitted Beanies, Vintage Laminate Tables, Cat-tags & This Week's Wristwatches. I finally got around to taking our DVD/Bluray player to a guy who installs the chip which allows you to watch movies region-free. Now, I'm no DVD pirate, but I have a few movies (in both formats) that I got off eBay simply because they weren't available here in Australia for our Region 4 DVDs and Region B bluray discs. I doubt that I'm contravening any region policies here. The movies that I want to get are long gone from any cinema. And the fantastic Criterion Collection offers a range of films with extras that you just don't get with your standard releases that you might find at JB HiFi here in Oz or your local Walmart or HMV store. I used to have a decent (actually, very decent) library of movies that I recorded on VHS cassettes off TV back in the '80s, but as you might know, the quality deteriorates over time. Besides, who has the room to store VHS these days. And the video player/recorder is long gone, anyway. I bought a converter about six years ago and transferred a few tapes onto DVD-Rom, most notably our wedding video and tapes of the kids when they were toddlers. A few of the classic films that I had on VHS, I have since replaced on DVD over the years. One film, however, has been near the top of the list, but I've just been too lazy and/or have yet to find a decent DVD version of it. 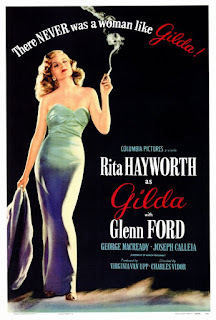 That film is Gilda, a 1946 noir directed by Charles Vidor* and starring Glenn Ford and Rita Hayworth in what is probably her most famous role. *It's interesting to note that the American poster for this film lists the director correctly as Charles Vidor, whereas the Italian poster - with the stunning artwork! - has the director listed as King Vidor, who was no relation to Charles, and was responsible for directing the 1946 Western classic Duel in the Sun. 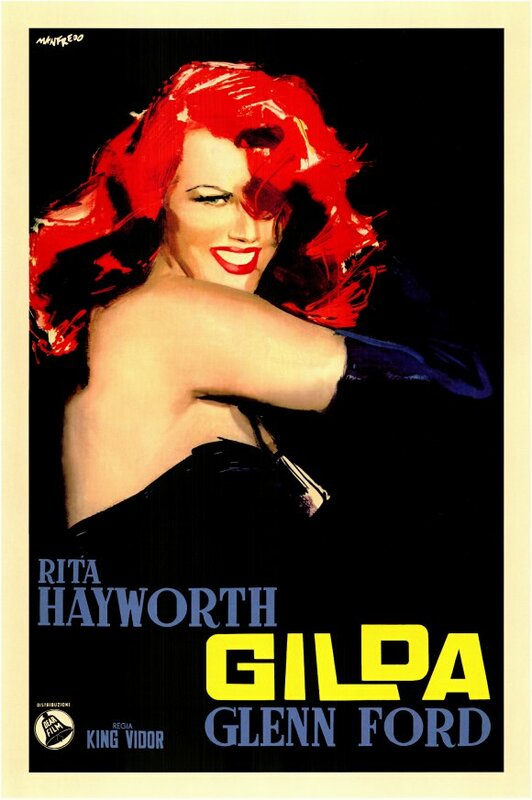 Okay, back to Gilda. The story concerns Johnny Farrel (Ford) a fella who scrapes a living as a gambler in Buenos Aires. After winning at craps against some shady characters at a seedy dock, he is accosted by one of the losing players and is rescued by millionaire industrialist Ballin Mundson (George Macready) who carries a walking stick with a knife blade hidden in it. The industrialist tells him there's a gambling ship moored at the dock, but warns him not to try the same (cheating) tactics there as he did with the guys at the craps game a few minutes earlier. Johnny visits the gambling ship and cheats at the blackjack table. He is busted by security and taken to the ship owner's office. The owner turns out to be Mundson. Johnny convinces Mundson to hire him as a security expert. 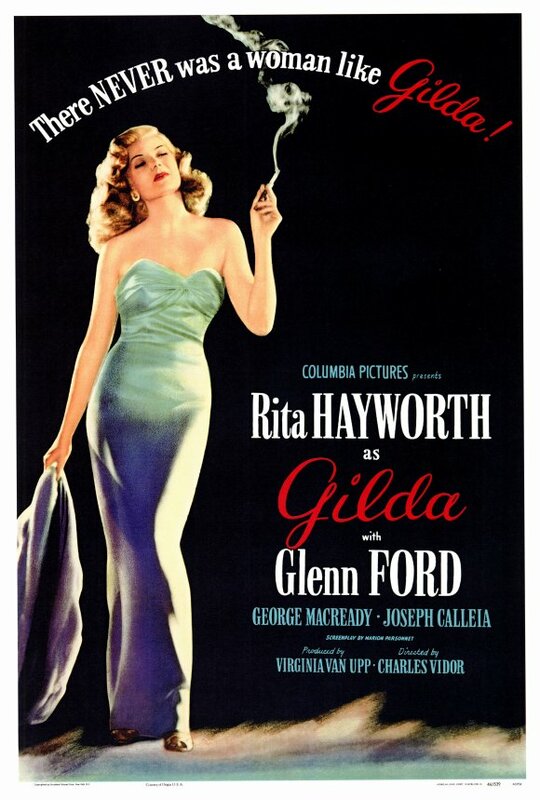 Mundson soon goes off on a trip and returns some time later with a new bride, Gilda. All we see is bedroom wall for a split second before Hayworth tosses back her mane of hair, appearing in the shot from the lower edge of the frame. 'Me?Decent? ', she answers, before catching a glimpse of Johnny, who takes a step forward, eyes widening in surprise. Her smile fades and her expression hardens. These two have a history. "Sure...I'm decent', she adds, the comment more of an assertion than a mere reply. Gilda holds the guitar by the neck. know how much I hate you, Johnny? The screenplay was written by Jo Eisinger and Marion Parsonnette and this is one film noir that has been constantly written about over the years and it fully deserves its classic status. I had to get this movie on disc. The Criterion Collection has it available. And I'm gonna get my mitts on a copy. Very soon. When I got the BluRay player home, I put on my Criterion Collection copy of The Life Aquatic With Steve Zissou, Wes Anderson's wonderful film from 2004. This was a US region copy of the film and it played without a Hitch. It's a great film. Bill Murray is Steve Zissou, a Jacques Cousteau type ocean explorer, even down to the red knitted beanie. He is on a quest to find what he calls a jaguar shark, a large predator that devoured his long-time crew member and friend, Esteban. Meanwhile, along comes a young man named Ned Plympton (Owen Wilson), who may or may not be his illegitimate son. Wes Anderson always assembles a great cast for each of his films and he has a unique eye and sensibility which permeates throughout the entire look of his films. If you've never seen any of his films, this is a good place to start. Follow it with The Grand Budapest Hotel or The Darjeeling Limited to get an idea of his style. The blue-dialed Seiko was worn for handyman duties on Saturday afternoon (more about that below), while the Movember Edition Oris Diver SixtyFive got the most time on my wrist. I briefly wore the Submariner later in the week before switching to the blue/black dial Oris Diver SixtyFive sometime on Thursday. On Friday, I brought the Movember Oris and the 1969 Omega Seamaster to work with me. I just couldn't decide which watch to wear. That's never happened to me before. I began my workday with the Seamaster on my wrist. It was a busy day and I had a tonne of stuff to get through. I wanted to wear something that was a little more business-like. I was wearing a tie and waistcoat. 'Cos ya gotta look like you mean business. So, when I got to work, I switched on the computer, put my game-face on, and got to work. Plowed on through till 1:40pm and then had a quick spot of lunch (toasted ham, cheese, tomato sandwich) and got back to it. Got everything done, plus some other stuff that wasn't on the agenda for the day, and left the office with a clean conscience and a clean slate. Part of me is tempted to remove the little metal studs along the framed edge and replace them with brass screws instead. I'm thinking, though, that this would take away from the mid-Century aesthetic. Best leave well enough alone. Saturday night's Lolly Nite Movie was a French film called L'Odyssey (The Odyssey, Dir: Jerome Salle, 2016), based on the life and exploits of French inventor/explorer/oceanographer Jacques-Yves Cousteau. I was almost going to say no to this film, having just watched the Wes Anderson film earlier in the day, but what the hell. It was a nice movie, with gorgeous cinematography as it traces the life of Cousteau from 1949, shortly after he has invented the aqualung, right through the subsequent expeditions and documentaries that he made aboard his research vessel, The Calypso. Of course, this kind of storyline, while okay, is not enough to sustain the drama that is required in a movie, so we get the underlying sub-plot of Cousteau's relationship with his younger son, Philippe, who doesn't seem to share the world's fascination with his father. Lambert Wilson gives us a great performance as Cousteau. I haven't seen him in much, although I do recall him as the Merovingian in The Matrix Reloaded (Dirs: The Wachowski Brothers, 2003). The wonderful Audrey Tatou stars as his wife Simone, who shares his passion and vision, but endures his many infidelities throughout their marriage. I did laugh a few times as I saw parallels between this film and The Life Aquatic. Our younger cat Bowie managed to lose his collar and council registration tag a few weeks ago. I called the council to organise a replacement tag. It arrived a few days ago. I grabbed a small screwdriver and etched his name onto it before fitting it to his new collar. Let's see how long it takes for him to lose this one. Okay, all, that's about it for another week. I've switched over to the WatchCo build Omega Seamaster 300. This watch appeared on the wrists of Cousteau's crew in the movie last night. The film-makers did their homework, for it appears that Cousteau and his crew did in fact wear Seamaster 300s throughout the late 1960s. Okay, this finger of mine needs a new bandage. That disinfectant swab is gonna smart. Thanks for reading, and have a good week ahead, folks! Congratulations on the 2 years at your job! Now 30 here in the states is quite cold, but I enjoy 30F better than 30C. That is a sharp looking table. I had a full dining set with table and chairs that looked quite like that one until I moved to Florida.